Yesterday I went on an adventure with Kate … over the mountains to Builth Wells and the magical land of Wonderwool. The road’s so small it barely appears on the map! We were quite surprised, therefore, to meet an articulated lorry part way! Fortunately for us, he had clearly decided that he’d made a mistake and had pulled in to one of the very few places it was possible to pass such a large vehicle – a forestry track where, with some manoeuvering, he could turn around. He wasn’t still there when we came back, so clearly he’d managed it. We got to Builth and the Royal Welsh showground without further incident but ill-prepared for the woolly assault on our senses. There was just so much to see and so many stalls. We spent at least the first hour wandering around, stroking things and saying ‘wow’ before we were able to pull ourselves together enough to sit down with a coffee and formulate a plan. This was quite difficult, because all the stands were so mixed up that it was not possible, for example, easily to compare all those selling alpaca yarn without walking about 15 miles back and forth. 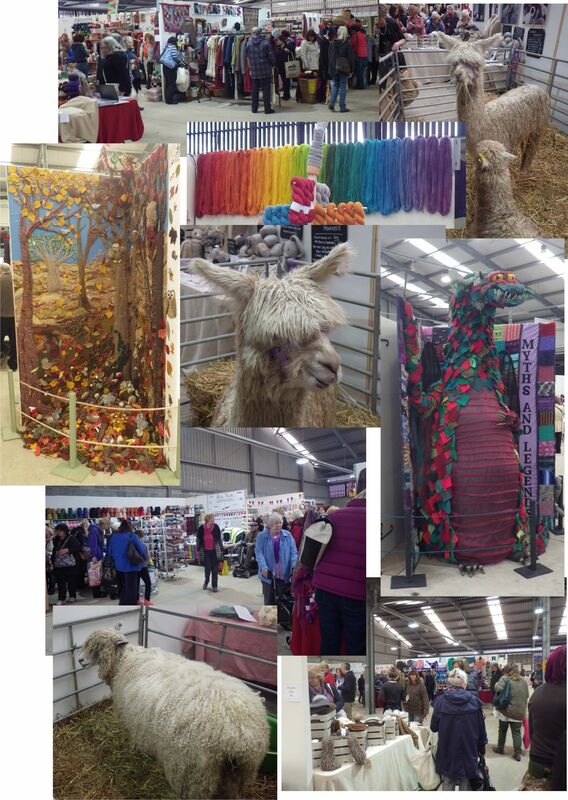 However, part of the reason for going was inspiration and there was certainly plenty of that… from felt quilling to interesting bags, from a dragon to an autumn woodland, as well as yarns in every colour and gauge. Not to mention a few of the most important contributors: sheep and alpacas! 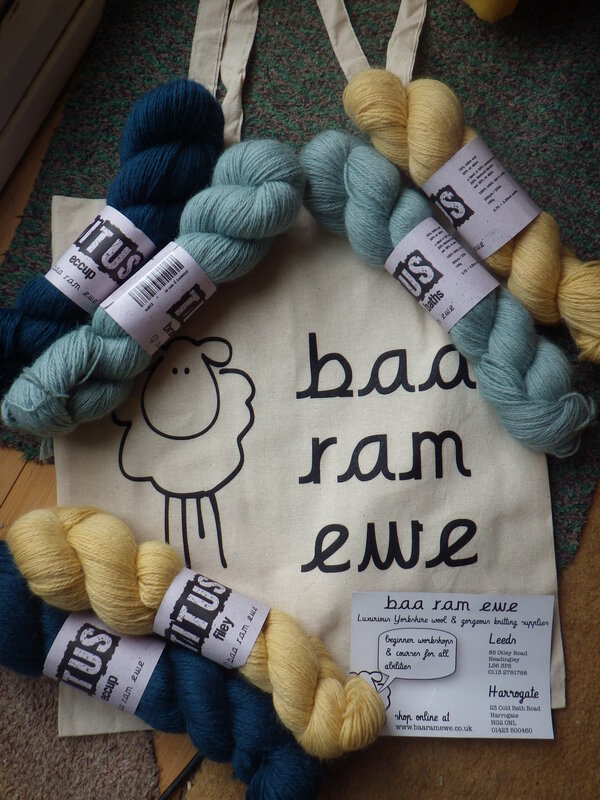 I fell in love with this yarn for several reasons: it’s amazingly soft (a mix of alpaca, Blue-faced Leicester and Wensleydale wool), it comes from Yorkshire and all the yarn colours are named after places I knew as a child because that’s where I grew up. The three I chose are: Eccup (the reservoir a mile from my old family home), Filey (a seaside town we used to go to for the day in summer) and Bramley Baths (well, we used to go swimming at Meanwood Baths, but close enough!). I also love the company name… and the fact that the yarn came with a lovely cotton bag. It wasn’t cheap yarn and so it’s going to be quite a luxurious blanket, but I’m really looking forward to working with it. I was unsure about which colours to choose and dithered a lot about ‘Filey’ because it’s not a colour I would wear, but (as Kate pointed out), I’m not going to wear my blanket, am I? Now, I think I was quite restrained, don’t you? That’s great… I realised I should have photographed Lucy the Tudor teaching you to spin, but I was so intrigued I didn’t think of it! Looking forward to seeing a finished product! I looked up lucet. That’s a fascinating thing! It looks really useful. You were incredibly restrained considering the temptations before you. The dragon looked amazing trouble is I’d never get it in here. You have to show us the finished socks in that amazing mix of colours. We couldn’t have fitted the dragon into the car! I wonder if the socks will look as good knitted up as the ball goes now! I really think that I bought so little because I was overwhelmed… now, if I go next year it may be a different matter!! 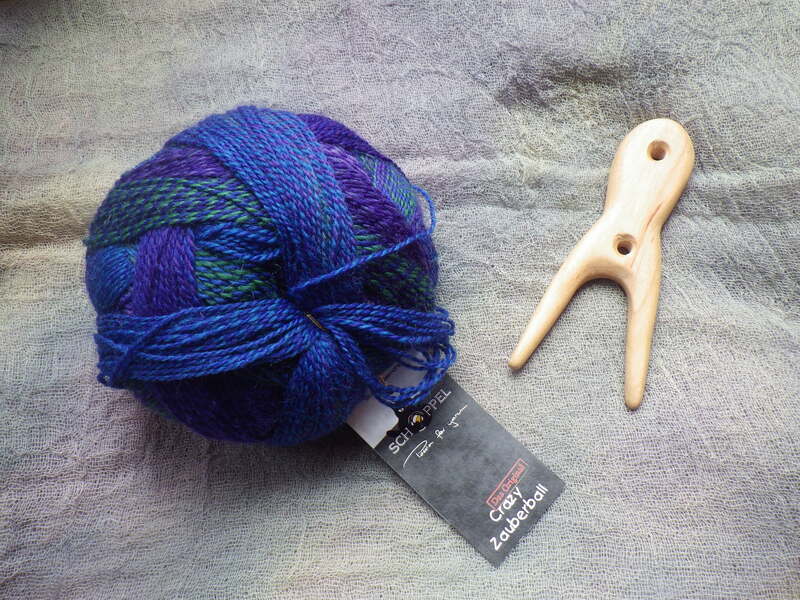 Lovely yarn, lovely lucet. And I’m deeply jealous of your visit. This isn’t sheep country and I doubt we’d ever get anything like that here. Maybe further south, where the weather’s cool enough for sheep. I can see that it’s been a weekend of restraint all round. I’m now slightlly wishing I’d bought more of the Cleckheaton Ocean and Volcano… too late! I’m stopping myself starting the blanket just yet… I want to finish something first! Okay, I will ask (because I am too lazy to look it up!) what is a lucet used for? It looks beautifully smooth and tactile. The wool for the Bavarian blanket is wonderful. I think you have chosen the colour well, and how fabulous that the names have a resonance too. Enjoy! A lucet is used for making cords – it’s a bit like a French knitting dolly, but with only two ‘prongs’. I was really drawn to the one I bought because it’s so tactile… I don’t need many cords really! Wouldn’t it have been lovely to all have had a day out together? Never mind, at least we can share on line… I just wish you could handle the yarn – it’s so soft! I spent ages choosing the colours as there were so many nice ones. It’s a fine yarn, but should be lovely to work up. Thank you for the inspiration and tutorial! I adore that dragon and Mr snail-of-happiness is going to be the envy of all of his mates with the results of that gorgeous wool. Oh what SCRUMPTIOUS wool you have Ms Snail! OH how happy you must be with that gorgeous haul and oh how pretty that wonderful Teddy/Tottie bavarian is going to be and I, too, love that it all came packaged in a delicious cotton bag :). I’ve already started on the first sock… it’s looking good!